Place uncooked rice in coffee in double boiler. 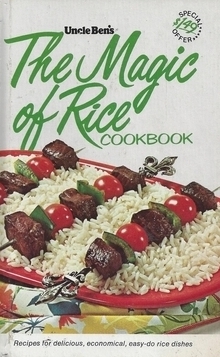 Cook approximately 35 minutes or until rice is tender. Add butter, then combine thoroughly with remaining ingredients. Pour into buttered 1-quart baking dish. Sprinkle with cinnamon, and set in pan of warm water. Bake in 350 degree oven for about 50 minutes, or until knife inserted in center comes out clean. Serve hot or cold, with whipped or light cream. Serves four.